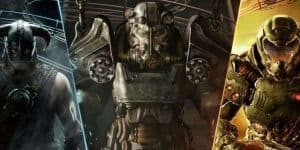 Bethesda's New AAA Title is "Freemium" | Nerd Much? According to a job listing posted by Bethesda, the developing studio is looking for a Game Performance Manager to work on a “bleeding-edge AAA freemium game.” Despite the more common phrase being ‘cutting-edge’, maybe it’s a French thing, as the post is for the Montreal studio. There are no other details provided, only that one phrase. However the president of Bethesda Todd Howard did mention that the company is working on a new mobile game (though this job listing is posted separately from mobile game related positions), as well as six other projects. At the time he mentioned the latter mobile game, Fallout 4 VR, Skyrim for the Switch, and Elder Scrolls 6. Thus, this listing is likely referring to the as yet three unannounced titles, two of which are apparently bigger than anything Bethesda has done before. Which is definitely saying something, since they’re responsible for Skyrim (one of the largest MMO’s on consoles) and Fallout. According to Howard, these two huge titles will likely arrive before Elder Scrolls 6. Well, if we don’t see something new from Bethesda at E3, I’ll eat my hat. Though I think we shall always be on the edge of our seats during gaming’s biggest show, quite a few companies have something big coming, or are expected to. Be sure to check out the schedules and reasonable expectations over at our E3 2017 hub.